This is my punishment whisky. I drink a bit of it every day (as you can see, quite slowly – possibly a teaspoon every day in the tiny glencairn I received from the Lagavulin distillery) because I foolishly purchased it Edradour. It is here to remind me that I should never judge a Scotch by its age and as a lesson to not be so cheap with whisky. As we mentioned before, we were at the magical wonderland that is the Edradour distillery (again, highly recommended that you visit) and instead of purchasing a beautiful Signatory bottling of some delicious ancient scotch for around 200GBP, I instead spied the Port Dundas 22 year for a “steal” of around 110GBP. What a terrible mistake. At the time, I also did not quite understand the difference between grain whisky and malt whisky. Now I know. *Side note: we did, however, also get the Ballechin rum finished cask strength and the Ballechin port finished cask strength bottlings – which were excellent deals and delicious. Reviews forthcoming since we’ve nearly knocked those two bottles off so they’ve been thoroughly “tasted” for tasting notes. 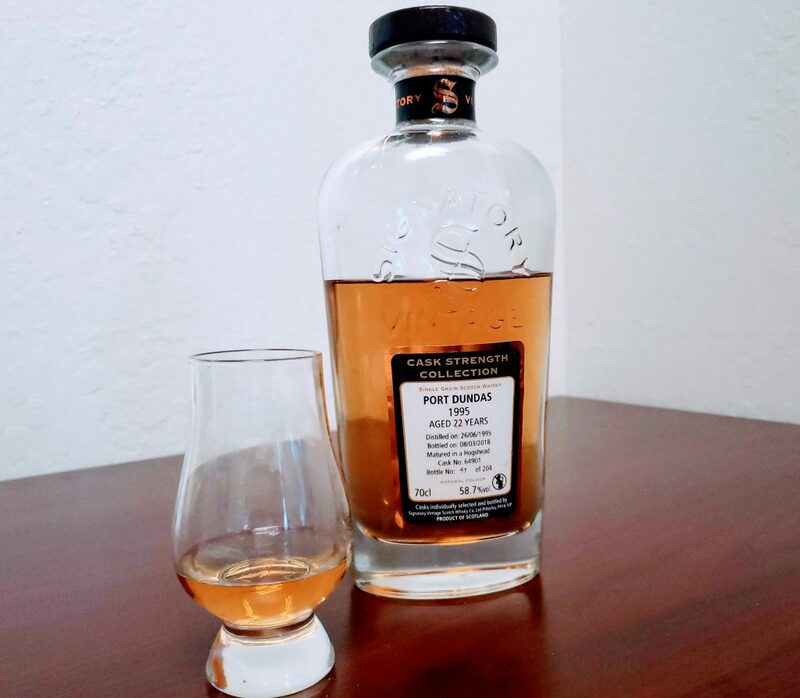 Port Dundas 22-year-old. On my desk at work. At least the bottle’s pretty. Palate: Caramel extract, with some sweetness. You can almost discern cherry and chocolate if you really strain your palate. But there is a strong alcoholic burn, even with substantial water added. Overview: I drink this because I hate myself. Also to assure myself that I am definitely not an alcoholic. I tend to dread my daily sip of it because the mealy taste does not clear out of memory easily. Bought for: ~$125 (around 95 GBP) at Edradour Distillery. Despite not enjoying this whisky, the rest of their lineup is beyond excellent and we highly recommend you visit. Read about our visit to Edradour Distillery in this post. The Signatory warehouse is an Aladdin’s cave of old scotches.